Women were at the forefront of the pro-democracy protests in Libya in 2011, which, after escalating into civil war, culminated in the ousting of dictator Muammar Gaddafi. But in the years that have followed, as state institutions have crumbled and insecurity prevails, women have struggled to have their voices heard. AWID spoke to Alaa Murabit, founder of The Voice of Libyan Women, an organization working for women’s economic and political representation, and against violence against women, to discuss their work and the situation facing women in Libya today. AWID: What motivated you to establish The Voice of Libyan Women? How do you stay motivated in the face of turmoil? Alaa Murabit: Founding The Voice of Libyan Women was about ensuring that women were taking their rightful place as leaders of the movement to rebuild the nation. I had worked with a lot of very wonderful women during the revolution and I felt that, for lack of an organizing body, they were no longer doing the work they had been very passionate about. They were going back to their more culturally accepted roles. We have faced a lot of difficulty the whole way through. The hardest thing has been losing people in our networks. After that I found it hard on my conscience, knowing the risks, to go ask families to let their daughters and sons join our projects. But in terms of motivation we do just do it. We just do it because nobody else will. AWID: How would you describe the current situation in Libya, the key actors and their impact on women’s rights? AM: It has become exceptionally dangerous to be involved in women’s rights, and for this reason the majority of activists are no longer in the country. For example, here in Zawiya, the road to Tripoli has been cut off for now three weeks so we can’t go to the capital. Daily life is characterized by insecurity. It’s exceptionally difficult to work but still the only way to be trusted by local communities is to be physically there. This creates a pretty tough dynamic. There’s also this interesting thing that happens when a country is going through conflict: everybody you talk to says “we should leave women’s rights on the backburner because we have priorities”. At the time of the revolution everyone was saying “you need to be involved, this is important if you want to live in dignity”. Now if we say the same thing back, the response we get is “you guys are being selfish, you need to focus on the greater good of the country”. Who are the main actors? That’s probably the best question you can ask about Libya—nobody really knows! You have the various militias, and a lot of the funding for these has been coming from other countries. Then you have the international community, which kind of parachuted in with all this money that was used improperly and then left when it got difficult; and civil society was not built up enough to fill the gap that the international community left—civil society didn’t exist in Libya until 2011. Then there is obviously religious leadership, which is at its strongest now. AWID: You focus on the use of Islamic texts in your advocacy. How does this help your organization to promote women’s rights? Have you come up against any barriers when using this approach? AM: In 2011-2012, we had been focusing on political and economic empowerment, and we used international conventions quite heavily. We faced the problem that the same faces were appearing at all the workshops, because there are certain families that are okay with their daughters being involved. The work wasn’t trickling down to other parts of society. The main comeback we faced was that “Islamically a woman cannot be a leader”, or “Islamically a man can hit his wife”. But I was raised Muslim, and these people were talking about an Islam I did not identify with and I did not understand. So for everyone in my organization it became a question of common sense to address this. 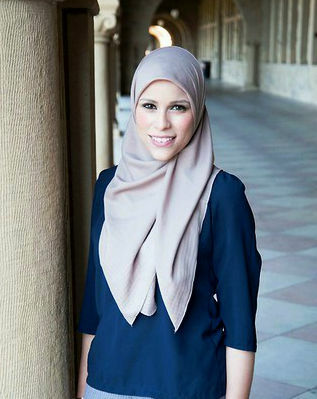 Our first campaign was International Purple Hijab Day. We did this first to test the waters. Our hypothesis was, that if we talked about religion we could get into more homes of people who wouldn’t usually speak to us—they might not agree with us but they would at least have a conversation. 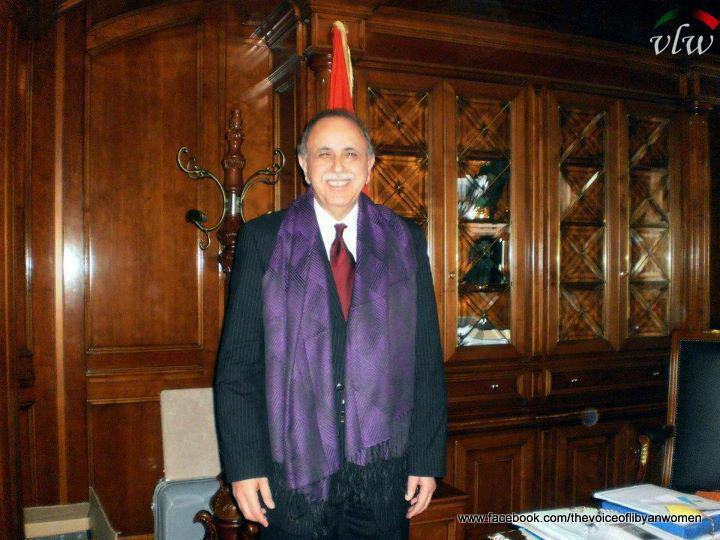 Prime Minister El Keib wearing a purple scarf in support of the Purple Hijab Day Campaign. The response to the campaign was overwhelming. In the first year we had 17,000 people wear purple scarves, ribbons, or ties in support of action against domestic violence. We had the then Prime Minister Abdurrahim El Keib go on TV wearing his purple scarf and say that domestic violence is un-Islamic. So this was a really big indicator that this was a route we should go down. One of the problems we faced during the Purple Hijab Day campaign was that people would say “oh they’re just a women’s rights organization, they’re modifying religion how they want it”. But actually we were taking the verses exactly as they were written, and it was just because of who was delivering them! So for our next campaign, the Noor Campaign, we went to the House of Fatwas and got them to authenticate the hadiths that we were using. Then when we walked into communities nobody could say this wasn’t legitimate. This did bring some criticism, particularly from international organizations who said that we were strengthening the religious leaders, or that we shouldn’t be getting involved in religion. But to me that was a bit ironic, because how can you talk about women’s rights without religion when religion affects women’s rights so much in this country? Of course, we did have to make compromises, but the larger audience we got made it worthwhile. Previously we could not get permission from the Ministry of Education to go in to schools and we were not able to get permission form the Ministry of Media to put anything on TV even if we paid. After we got the signature [from the House of Fatwas], we got permission to go into every school nationally, and not only got permission to put our campaign on TV, radio, and billboards, but were told that the Ministry of Media would pay for it! I think you will get nowhere if you say: “we want women’s rights and we’ll only do it this specific way”. It was clear to us that if we continued to speak in “women’s rights speak”—CEDAW and 1325—then there wasn’t going to be anyone at the table but us. AWID: How is it that extremists have been able to gain power in Libya? AM: In Libya this is not an ideological extremism, it’s a practical extremism. People are thinking “this is one way our young boys can make money, this is a way to protect our community or our interests”. For the local communities, people are trying to combat it, but people say, and I hear it every day: “What’s the alternative?”. Extremists gain ground when they become the major service provider to people. Added to this, is the constant climate of fear I mentioned. Every day when my brother leaves for school my Mom looks like she is going to have a heart attack—it only takes one person to say that he is on the wrong side for him to not come home. In this kind of climate, and with no alternatives presenting themselves, people turn to what’s there to give them security. People will say: “if it’s not them then we’re going to have our neighboring militia”. It’s this very weird dichotomy where militias can exert control and fear at the same time they garner support. This is their greatest asset. And when there is nothing in your control, being given a space where you feel in control is very appealing. When a young man has failed to provide for his family and is given a chance to be a “hero”, that’s very powerful. And women are not only victims – many women give support to these groups for similar reasons; they offer them a sense of agency they haven’t found elsewhere. AWID: What have been the greatest challenges that you and your organization have faced? How did you overcome them? AM: One challenge we have faced is the fact that there is a huge disregard, almost disrespect, for young women activists. Young women get the raw end of an already raw deal. People assume we don’t know what we’re talking about. I felt this in Libya but also elsewhere, in the States or Canada for example, where people thought we couldn’t do anything as young people—unless it had something to do with social media! The greatest challenge has been the lack of support for women human rights defenders in Libya, especially in terms of our security. I’ve had conversations with people from international bodies who would say “well this is too dangerous for us, but why don’t you go do it?” People say “it’s got to be led from the ground” but nothing can be done if everyone on the ground is terrified! Of course, this is our country and we want to do the work, but without the proper security support how can we? You have international bodies spending huge sums on employees who won’t leave Tripoli, and that money would easily pay for the security women activists need. You have international bodies saying “we value women’s voices”… but what about valuing our lives?